We had a guest lecture by Jeffrey Moussaieff Masson the other day. When Masson finished his training and was about to start a position at Berkeley, he was called to London by Eisler who had Freud’s archive in London and needed someone like Masson – who was unconventional because he didn’t like psychoanalysis – to take over. He only needed the ok from Anna Freud (Freud’s daughter). He didn’t make a good impression and only upon his second meeting with her – when her dog made a connection to the animal-loving Masson – she was open to talk to him. Masson was drawn to find out more about the only thing that continuously interested him; why Freud had published a paper on how hysteria was due to sexual abuse and then changed it to the Oedipus effect. So instead of first having believed his patients he then said their stories about being abused were merely fantasies. He told Anna that he was keen to see the letter exchange between Sigmund Freud and Wilhelm Fließ that had remained unpublished, hoping to find answers to his questions in them. He asked whether Anna would give him the letters if he came back in 6 months being able to converse in German and she agreed. Even though his German wasn’t terribly good, Anna ended up giving him the letters to study them back in the States (with someone who knew German well). Freud initially believed his patients when they told him about having been sexually abused and consequently published a paper on his seduction theory (or the origins of hysteria which is a form of neurosis) in 1896. Soon after though he took it back and replaced it with the Oedipus complex which states that e.g. a girl isn’t really abused but screens her own sexual desires at that age (infantile sexuality). The exact reasons why Freud did so are unclear however Masson found out that, before the paper was published, Freud presented it to a chair that said his arguments were ‘scientific fairy tales’ – possibly because many of Freud’s patients were daughters of his colleagues so some of his audience were blamed to be perpetrators. They walked out on Freud, mocked and avoided him leaving him without patients. He might have lost his courage, and Wilhelm Fließ was the only person he could talk to. In a letter to Fließ which students of psychoanalysis, including Masson, had to learn back then, Freud said that ‘he knew his patients were lying’ but he never explained why. An unpublished letter a year later in 1897 told the story of Freud stating that a 3 year old girl had been raped anally by her father and Freud believed the story as he knew the father who liked blood; he believed it to be a true memory and his new motto for the science of psychoanalysis was ‘Was hat man dir du armes Kind getan‘ (poor child what have they done to you). (Masson said to Anna that was the most beautiful line Freud had ever said but Anna had crossed it out to remain unpublished anyway). Masson had found the truth but Anna said it would just confuse people. Yet, Masson was the head of the archives so he had the copyright. He published all letters despite Anna’s warnings that people would be disappointed. His book was not welcome by psychoanalysts who were stuck in their traditions and had to look after Freud’s image, not wanting to raise embarrassing ideas. Masson was consequently fired and he was no longer allowed to call himself a psychoanalyst For the third time in his life he had the chance to change career – so he started writing about animals. He still wrote books against therapy though. Sándor Ferenczi, a Hungarian psychoanalyst whom Freud adored, decided that Freud made a mistake about retracting his seduction theory and wrote a similar article about sexual abuse. Freud told him he shouldn’t publish it as he’d lose his reputation, Ferenczi went ahead anyway. He lost his reputation and died soon after. In 1939, at the end of Freud’s lifetime, he still had material about child sexual abuse (letters from Ferenczi etc) in his drawer. Robert Fließ (Wilhelm’s son) who was born in 1895 became a prominent psychoanalyst in New York. Toward the end of his life he recovered memories of his father Wilhelm having abused him when he was 2 years old, which took him many years to come to terms with. He recognised that abuse was real. “Nobody falls ill from memories”. Freud (initially), Ferenczi, and Robert Fließ were right in believing their patients’ stories. Once the truth came out, patients no longer wanted to see their psychoanalysts who had blamed their memories to be ‘false’. Psychoanalysts backtracked to acknowledge sexual abuse (and they denied they’d never denied it!). Very few women would come forward telling about their abuse if nothing had really happened, there’s only a 3-5% chance that their stories wouldn’t be true. Obviously, accused men wouldn’t jump up, and so the ‘false memory foundation’ was formed which was a group of mainly fathers that had been accused of sexual abuse by their daughters. Patients develop transference – fantasies about their analyst – which burdens the analyst because it’s unreal but they don’t tell this to patients. Patients develop transference because they trust their listener (analyst) in a way they don’t trust anyone else, telling them about your life and secrets. The analyst’s opinion becomes very important to the patient, the patient wants them to like them (the analyst is cathected: a highly charged person in their life). The patient wants to know everything about their analyst – who is that person they’re trusting everything to? 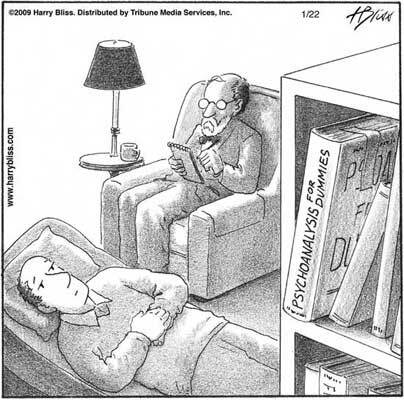 The problem with psychoanalytic therapy (PT) is then, that the psychoanalyst merely just listens. Masson said about himself that he was always a bad listener; he wanted to talk not just listen. Some people in class were better at this, others were worse than him though. He wondered how anyone could ever be good at being an analyst? How can the patient ever know who their therapist is? They might wonder whether their therapist secretly gets pleasure from hearing about their abuse? Whether they actually care, like them, understand them? How would they ever know if the therapist just listens and never really talks? Another problem with PT is that a therapist might push their patient into thinking that they e.g. Have been abused, as psychoanalysis believes that traumas may be repressed. So you might not remember being abused but then start to believe so because your therapist does. “You cannot just believe something because an experts telly you!” How can you decide whether a memory is true or false if there’s no evidence? No one knows anything about human emotions more than anyone else! This entry was posted on 21/06/2013 by G in Psychological Issues and tagged Anna Freud, electra, Freud, Jeffrey Moussaieff Masson, oedipus complex, psychoanalysis, psychoanalytic therapy, Psychosexual development, seduction theory, sexual abuse, Sigmund Freud.